I know this is a slightly out of focus photograph (maybe more than slightly), but the brushes are more than slightly worn, so the fuzziness may be more flattering. These are my favorite brushes, Windsor Newton Lexington II's. They're not expensive. The bristles have just the right amount of stiffness combined with springiness for my style of working. The bristles are just the right length. I love the rounds and the flats and the filberts and every other style they make. I'm very hard on brushes. I scumble a lot. This means that I scrub the brushes over the surface of the painting. It wears the bristles down. I don't particularly like a brand new brush. One that is well broken in is just perfect. It's wonderful for awhile and then suddenly, it's just too worn out. Kind of like a good haircut that is best after the first few days, great for weeks, and then all of a sudden almost overnight, way too shaggy. Which brings me to a little paranoia. It seems that my brushes break down in a group. I'm going along just fine and then suddenly one day, a bunch of my favorites have just had it. I panic. Lexington II's aren't the easiest brushes to find. My favorite art supply store, Arizona Art, carries them. But only at the store in Phoenix, a 2 hour drive away. 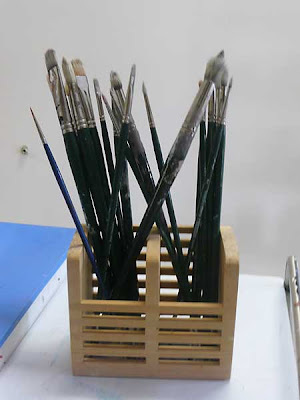 If I think ahead, I can order them from the local Tucson Arizona Art Supply and the brushes will arrive in a few days. Somehow, I never get around to going online to figure out where else to get them, probably because I don't think about it unless I'm in crisis mode. None of the catalog stores I use carry them. I've looked at other art stores, to no avail. This is when I get real nervous. What if Windsor Newton has stopped making them? Then what will I do? It's the stuff of nightmares! On the other end of things are the feet. Mine hurt. They hurt a lot. It's probably because I taught art in a facility with a concrete floor. And I lived in a home with a concrete floor. Then I moved to an apartment with a concrete floor and acquired a studio space with, yes, a concrete floor. Now my brand new studio, which I love, also has a concrete floor. A normal person would just sit down. I rarely sat down when I taught art. I even more rarely sit down to paint. Sitting just isn't something I do well. What you see above are a pile of life savers. They are FitFlops, a sandal from England, sold in the USA. I'm not sure what it is about them that works so well. Believe me, I've experimented with just about every shoe style and brand known to man. I discovered FitFlops last year via an add in the New York Times. Having been burned too many times to count by shoes that feel great for the first 1/2 hour and then no longer hold the promise of comfort, I was dubious but curious. I bought my first pair. It was like a miracle. No more foot pain. And the comfort continued on, month after month. Paranoia kicked in again. What if the company goes under? What if they repurpose the style or change materials? Hence, the pile you see in the photo. I currently have 5 pairs of FitFlops. They are worth their weight in gold. I'm thinking I'd better get to the store to pick up just a couple more pairs, just to be safe.